1956 Topps #235 Don Newcombe Card! Brooklyn Dodgers! Los Angeles! Rare! 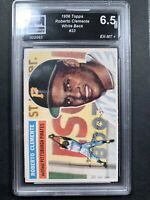 1975 TOPPS MINI #194 1956-MVP'S MANTLE/NEWCOMBE PSA 8 NM/MT CENTERED! 1975 TOPPS #194 1956-MVP'S MANTLE/NEWCOMBE PSA 8 NM/MT CENTERED!